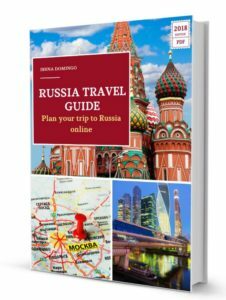 Registration in Russia is one of the matters that generate more doubts in foreigners who visit the country, especially those who are going to stay in apartments or private houses. In this article I will try to clarify the most frequent doubts that arise at the time of registration. 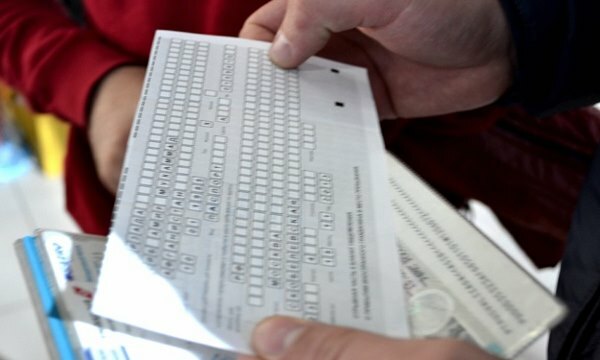 When is it not mandatory to register? The registration is basically the process by which the Russian authorities are notified, after your arrival in Russia, of the place where they can find you if needed. It is generally seen as a process of the Soviet era, when authorities monitored the migratory movements of people and could limit their movement throughout the country. The good thing is that since 2011 the registration procedure for foreign citizens visiting Russia has been simplified and now is much easier than before. The bad news is that despite this simplification, the legislation remains unclear in some respects, making each organization to interpret it differently. In this article I will try to clarify how the registration procedure in Russia currently works, which is mandatory for all foreign citizens traveling to Russia, though the responsibility for the procedure always lies in the host party. If you are staying in Russia less than 7 business days, you don’t need to register. For example, if you arrive in Russia on Saturday, August 1 and leave on a Monday, August 10, then you don’t need to register since your stay will be 6 business days. Weekends (Saturdays and Sundays) or the holidays don’t count as business days. The documents that justify your arrival and that allow you to make you the count of the 7 business days are the tickets of the means of transport that you used to enter Russia, be it airplane, train or bus. In May 2017 a new regulation was issued. Foreigners must register the first day of their arrival between May 25, 2018 and July 25, 2018 in the cities hosting the World Cup in Volgograd, Yekaterinburg, Kazan, Kaliningrad, Moscow, Nizhny Novgorod, Rostov-on-Don, Samara, St. Petersburg, Saransk and Sochi. When you are going to be more than 7 business days in Russia. If you cross the border on a Monday, then you have to register if your stay is extended beyond Tuesday of the following week. If you are traveling from one city to another, then you must register in the new city if you will be staying in it for more than 7 business days. In this case you will be “deregistered” from a city and registered in the new city on arrival. If you will stay 5 business days in one city and another 5 business days in another, then it is sufficient to register in the first city, since your total stay in Russia will be greater than 7 business days, but it will not be necessary to register your stay in the second city, as your stay in said city will be less than 7 days. If you enter Russia several times (through a double or multiple entry visa) then you must register each time you re-enter, if your stay is more than 7 business days. Hotel. If you stay in a hotel, then the hotel management is responsible for the registration upon your check-in. Apartment. The host of the apartment must make the registration, be it an individual or a company that manages the apartment. Private homes. If you are staying in a private home of a friend or relative, then your friend or family must make your registration at their home address. Registration is always the responsibility of the host, which must be a Russian citizen or a foreign citizen with permanent residence in Russia. Registration must be made no later than 7 working days from the arrival of the foreign citizen to the place of destination. The foreign citizen can’t register on its own, as it is the responsibility of the Russian host party. In no case is it mandatory for the foreign citizen to be present during registration. Directly in the regional offices of the General Directorate of Migratory Affairs of the Ministry of Interior of the Russian Federation (GUVM, its acronym in Russian). Previously this institution was known as Federal Migration Service (FMS) but was abolished in April of 2016. In any post office in Russia (they charge a small fee of 216 rubles). If you stay in a hotel, the administration will register you for free, though it is possible that some hostels or smaller hotels will charge you an amount (which can range from 200 to 1,000 rubles). It doesn’t matter if in your letter of invitation you included a hotel and finally you stayed in a different one, since any hotel has the obligation to make the registration. Your passport, from which they will make a photocopy of all pages (including the page where your photo and personal data are and the page that has your visa stamped). Your immigration card, from which the hotel will make a photocopy. 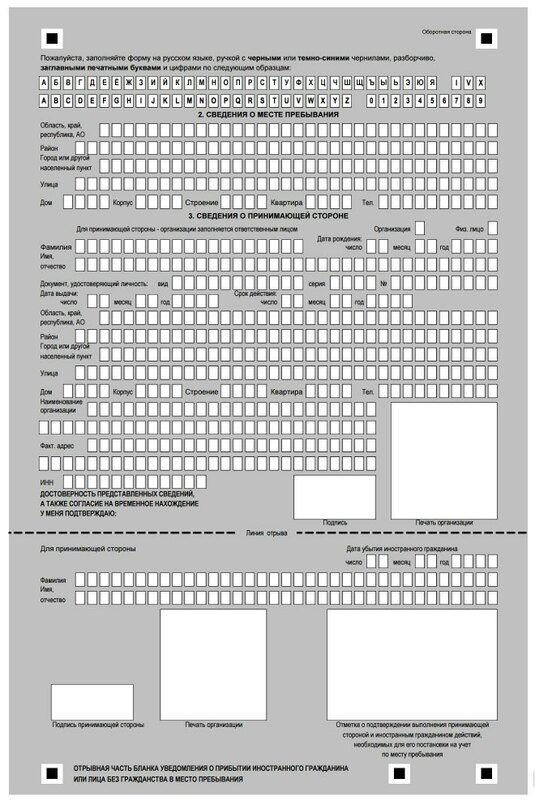 With this documentation, the hotel will fill out a special foreign citizen arrival notification form. The hotel administration will also be in charge of the registration process, by filling up the form and presenting it along with the rest of documentation before the Russian immigration authorities. You will be registered in 1-2 business days. The main part of the form is the one sent to the authorities, while the bottom part (from the dotted line), or a copy, is the one that the hotel can give you as proof and in which the address and the registration deadline is indicated. Once you leave, the hotel will also inform the authorities. In case you stay in a private apartment (e.g. Airbnb apartments), the host is obliged to make your registration; however, they are more likely to charge an amount for this procedure (between 500 and 2,000 rubles) and they may even refuse to do the proceeding (even though they have the legal obligation to do it). Before making the payment for the stay in the apartment, ask your host if they make the registration and the price they will charge you. If they don’t offer the registration service or they charge a very high price, then look for another apartment that does offer the service or applies a more reasonable fee. In case that you have already paid for the accommodation and the host does not want to register you at your arrival, what you can do is to contact the agency that issued your invitation letter to explain the case and ask them if they offer the registration service in the city where you will be staying. In this case, the agency will charge you an amount for registration at the agency’s home address or at another address. If the agency that issued your invitation letter does not offer the registration service, then you will have to look for one of the multiple agencies that offer this service. It must be an agency that has offices in the city where you are staying, since you must approach their offices and present the passport and immigration card so they carry out the proceeding. If you stay at a friend’s or a relative, then they can register you at any post office, though you also have the option to hire the services of some agency in the city, so they can register you. The registration procedure is the same if you are in Russia through a tourist visa or a business visa, the only difference is that in the case of business visa you can register for a period of up to 3 months. If you make the Trans-Siberian route by train and sleep on it, in this case the train ticket would be equivalent to the registration (you always have to keep your ticket in handy). The Russian police are not authorized to request proof of registration on the streets. The party that invited the person is the one responsible for any infraction that has occurred. If they ask you for this in the street (which is extremely rare) it is best to call the consulate immediately. Registration accreditation is not necessary to leave the country, though the immigration card is required. I hope this article has clarified how the registration procedure works in Russia. You can tell me your experience below.